Book, Booker, Bookest: How to Spell "SCIESZKA"
Whew, it's taken months of laborious work (enough to keep me away from this blog and my family), but I think I finally figured out how to spell "Scieszka," as in Jon (or is it "John?"). 4. Voila! 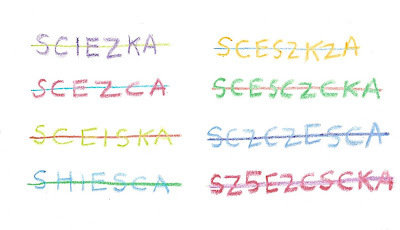 Now spelling "Scieszka" is a piece of cake, right? As you may have guessed, I've returned to the deep recesses of my linguistic laboratory, trying to decipher the actual pronunciation of "Scieszka." I've made some major breakthroughs and expect to reemerge in the winter of 2012 with exciting results. It starts with an "S,"
A nod to the Stinky Cheese Man. And follows with a "C,"
Can masterfully pull an "I,"
(Interrupting this poem to say that Jon helps all Guys Read). In case you missed it once, there's a second helping of "S,"
And now it's all too easy to say that Jon's the ________ . Instead of that, I have a question. What the heck is "Z" doing there? No one could have done it better!" Many thanks to Mr. Jon Sciezka Scieszka, our esteemed inaugural Children's Literature Ambassador, for representin'! Read more Scieszka appreciations at A Year of Reading blog by clicking here. This has got to be one of the funniest and most original tributes to Scieszka I've read yet. Thanks, Madigan:-) I'm glad you enjoyed it! Perfectly hysterical. Thanks Candace. But now I think I'm confused. This was one of my favorite posts of the whole Palooza! Very clever. Very. Thanks, Mary Lee. I had so much fun participating. You and Franki did a terrific job pulling it all together! Thanks, Jacqui! What can I say? They did a great job installing my cyber-cognitive circuits at the Robot Factory. Woops, I'm not so sure that I was supposed to divulge that.